Duke (in white) and Duchess (in black), enjoy a stroll through the Boston Common en route to Caturday. Both cats were adopted by human cat mom Kate Gallaher at the Marblehead Animal Shelter. Yes, you just saw a group of cats hanging out on the Boston Common. 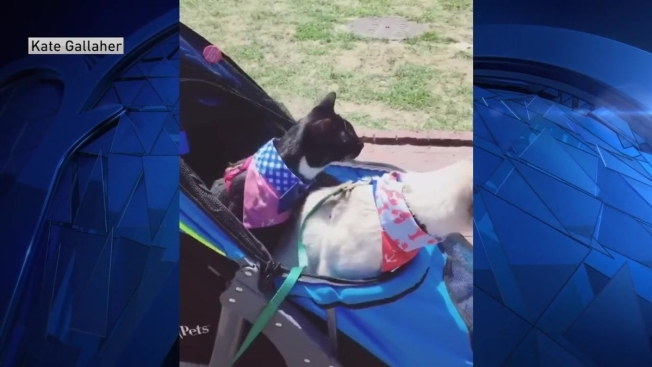 More than 100 cats, kitty parents, and cat enthusiasts gathered for Boston’s first ever "Caturday" on the Common on Sunday. The event was originally scheduled for Saturday, but was postponed due to rain. Despite the delay, cats came out in droves, some in strollers, others prancing about on leashes. "The event could have been postponed till next month, but I think the group was so excited for this event that we were like, 'puns be damned,'" Pauline, a 27-year-old cat owner from Melrose, told NBC Boston. One of her cats, Kai, travelled far to become a Bostonian — all the way from Hawaii. Pauline’s second cat, Jeans, is a local rescue. Kristin Leigh Porcello is an administrator of the Boston Common Caturday Facebook page, and one of a group of event organizers. Porcello said at least 20 cats came, "one even as young as 2 weeks old and whose human was demonstrating bottle feeding." She was thrilled by how many people were inspired to foster and adopt cats. Porcello also knows a thing or two about leash training, and began training her three cats at around 10 weeks of age. "I kept hearing how visitors were shocked with how at ease the leash trained cats were. I brought my two cats who were weaving in between groups of people looking to collect as much love and pets as they could," she said. Kyah Marrou drove in from Cambridge with her boyfriend and cat Coraline, a 4-year old cat adopted from a shelter in North Carolina. Coraline was pleased with the event. "Coraline was certainly enjoying all the attention she was getting, and even a few other cats walked over to say hi to her ... and it surprised me how well the cats were getting along with each other. From where I was sitting there was at least 30 or so cats," Marrou said. One cat popping up on social media was Alex, the 6-year-old orange Tabby. "I’ve been taking him out for walks on the Common since he was a kitten, so this Caturday get-together was on home turf for Alex," cat owner Steven Watson, of Boston, said. A real-life Jon Arbuckle, Watson knows Alex well. "Alex is used to being in the company of other felines, but never so many at once. We mingled for a couple of hours with a dozen or so other cats, usually one on one," he said explained. The best way to describe Caturday (and there are more planned in the future) is best summarized by organizer Porcello. She said, "It was a free roaming event, just cat people and their furbabies bonding."